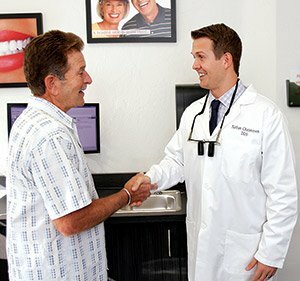 At Rancho San Diego Dental & Poway Dental Group we use the latest techniques and technology to provide the best possible results and maximum comfort with the most efficient treatment times. Our doctors are some of the most trained, experienced and respected dentists in their respective fields and have partnered to provide you with a diversity of expertise that together ensures you get quality dentistry and the right care for you and your family. We know that dentistry, especially major dental work, can be daunting. We provide a relaxing, friendly environment and attentive, helpful service to help make you comfortable. Our doctors always take care to listen to your concerns and to explain procedures thoroughly before beginning treatment, answering any questions you have. 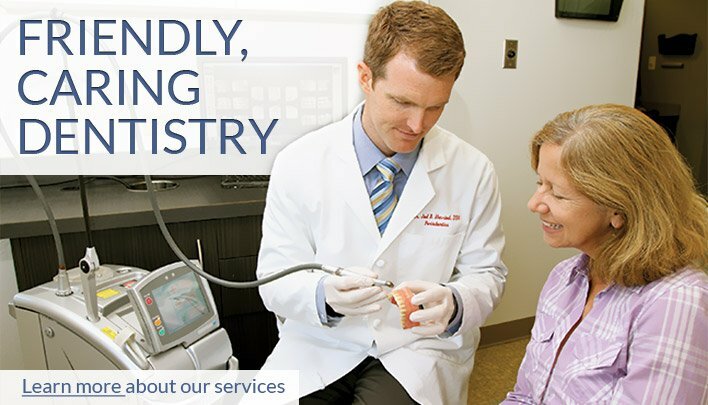 With our high-tech equipment and laser dentistry, many of the procedures can be done in a less or non-invasive way compared to traditional treatment; requiring less cutting, suturing or drilling. This means less need for anesthesia, less bleeding, swelling is controlled and there is usually little, or no, post-operative discomfort. With lasers, we’ve even eliminated the aggravating whining noises! We offer a full range of dental services to you and your family. With two specialists in-house, we can cover all or nearly all of your dental needs, from simple cleanings to even the most complicated dental work. Dental implants are the modern method of replacing missing teeth. They feel, act and look like natural teeth. With the advanced technology we use, and the advanced skills and experience of our dentists, patients will get accurate, lasting, efficient and comfortable dental implant treatment. We offer the full range of implant services: single-tooth implants, multiple teeth replacement, full-mouth reconstruction and denture stabilization. Our friendly staff are well-trained and attentive. At all times you will feel well cared for and our doctors are no exception; whether it’s the follow-up call your dentist gives you or the time he takes to explain your treatment and answer your questions. We offer comprehensive dental services for you and your family. Whether the patient is three, or 93, we have the knowledge, skill and experience to give you the best in dental care. Our practice is known for its use of the latest in technology in all procedures. We possess nine different types of lasers and feature a CT Scan Cone Beam. The lasers make all dentistry more comfortable, more efficient and less invasive (and less drilling); and help us achieve excellent results. Our CT Scan Cone Beam takes 3D X-rays of the mouth and head and provides us with a 360º view. This is an amazing adjunct for any kind of complex or major dental work, helping make it more accurate and more efficient. Advanced Dental Implant treatment with our skilled dentists. 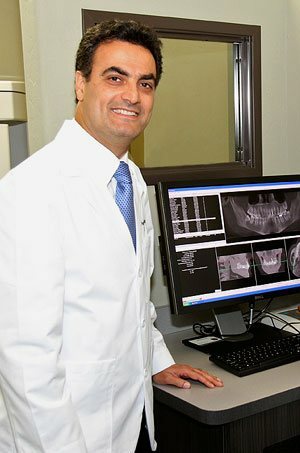 Dr. Meserkhani is a prosthodontist—a specialist skilled in the replacement of missing teeth and restoring natural teeth. In addition to his three additional years of advanced training in prosthodontics, he is a Diplomate in the American Board of Oral Implantology and an Associate Fellow of the American Academy of Implant Dentistry, a certification awarded to less than 500 dentists in the United States. Dr. Meserkhani is renowned for his skill in full-mouth reconstruction. Dr. Henriod is a periodontist—a specialist that takes care of gum disease and dental implants. He was voted Top Dentist two years in a row by readers of Pasadena Magazine. He is a Diplomate of the American Board of Periodontology. He will make sure your implant is properly placed and that you have no lingering gum disease that could create complications. Making sure you get the care you need! To help make it possible for patients to receive the benefits of modern dental implants, we offer competitive pricing with no-interest financing, affordable payment plans and take most insurance. 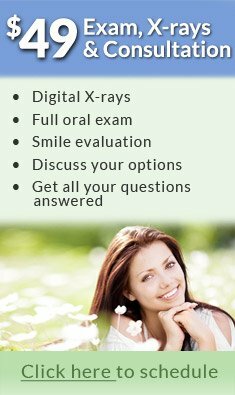 We offer a Complimentary Consultation to interested patients. You can meet our team and get a personal consultation with one of our doctors. The doctor will explain the different implant and treatment options and answer all of your questions.